When you put your children on a bus and wave goodbye, you are trusting that the bus driver is going to get them to their destination safely and securely. At FloridaTours.com, we recognize that transporting kids is a serious responsibility. And it’s not one we take lightly. Like you, there is nothing more important in the world to us than our children. So we will do everything we can to ensure that they are safe and secure wherever they go and whatever they do. 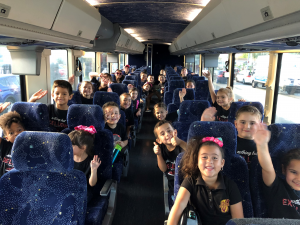 That’s why we consider all of our passengers — but especially the children we transport — to be precious cargo that needs to be treated with the utmost care and precaution. Field trips and class outings are one of the biggest business segments at FloridaTours.com. We have carried literally thousands of children of all ages everywhere across the state and beyond. And we have completed these trips without incident or accidents. That’s because our experienced charter bus drivers are trained and knowledgeable in the safe and careful operation of their vehicles. But they also are instilled with a deep respect for the responsibility they carry every time they close the doors of their bus and head out onto the open road. When carrying children, safety isn’t just the biggest concern. It’s the only concern. There is nothing more important than making sure your children get to where they are going safely and without incident. That’s why our drivers take such care and precaution when driving groups of schoolchildren to their field trip or class outing locations. We don’t take shortcuts. We don’t cut corners. And we don’t do anything that is going to put your children in harm’s way. We simply do everything in our power to ensure your kids are safe and secure from the moment they board until the moment we drop them off. After all, we’re parents, too.